- light is from ~14:00 clear sky sun, and it is not glare, I've taken many shots of colorchecker at the same conditions and I know what I'm doing. Problem is a bit strange: starting from some brightness all colors have pink cast. It is not very strong, but visible, and especially obvious when trying to set white balance using gray patches of color checker: with problematic patches WB becomes green. Also it prevents any software from creating custom profiles. I talked to P1 support, but they told me that it is normal and back is fully ok, while it is surely don't. So my question is - does anybody have\had such issue, and if it is resolvable - how to fix it? For now I can use that back while not using last stop in highlights, but for me it means I can't use it at all, as I'm shooting only landscapes. Raws of color checker for anybody who wants to play, there are different exposures and ..363.iiq have only white patch problematic, all gray are ok.
Why was the link to the RAW files removed? What profile and curve are you using? C-M-B wrote: Why was the link to the RAW files removed? I also was disappointed by this, as there were only 4 raws..
Curve does not matter, but most visible this problem is with Linear response\scientific. Profile does not matter at all. I already found the answer for my question - it is internal DB calibration issue, and can only be fixed on factory, so now I'm trying to send my back there. I hope this link is legal here. I just opened these file and I don't have ANY pink cast in any of the highlights of any of those images. None. Not even a little bit. Only when I set the curve to linear scientific do I get a slight magenta tone at some blurred areas. Is it possible your screen is not properly calibrated or that the color management of your display is messed up? Or are you automatically applying some kind of profile during import? What version of Capture One are you using? C-M-B wrote: I just opened these file and I don't have ANY pink cast in any of the highlights of any of those images. It is a bit strange. If you have all my sample raws, then please open CF000361.IIQ, and try to set WB by patches from white to gray. You will see that setting WB by white and light gray patches makes WB green, while other gray patches does not show such behavior. It is obvious that this making WB green shows that these 2 patches are pink. I also added new post on GetDPI with sample that is even more illustrative. C-M-B wrote: Is it possible your screen is not properly calibrated or that the color management of your display is messed up? No. I also tried it on machine without any calibration performed on, and also in software that is independent from any profiling - RawDigger. RawDigger shows real raw values, so I'm confident in what I'm saying. C-M-B wrote: Or are you automatically applying some kind of profile during import? No. The problem is clearly visible even with "No color correction" profile applied in C1. So it is not profile problem. C-M-B wrote: What version of Capture One are you using? The latest, 12 (tried on all builds of 12 branch). The same pink cast on these patches is visible in Adobe Camera Raw and RawPhotoProcessor. Well I don't see any pink casts anywhere. 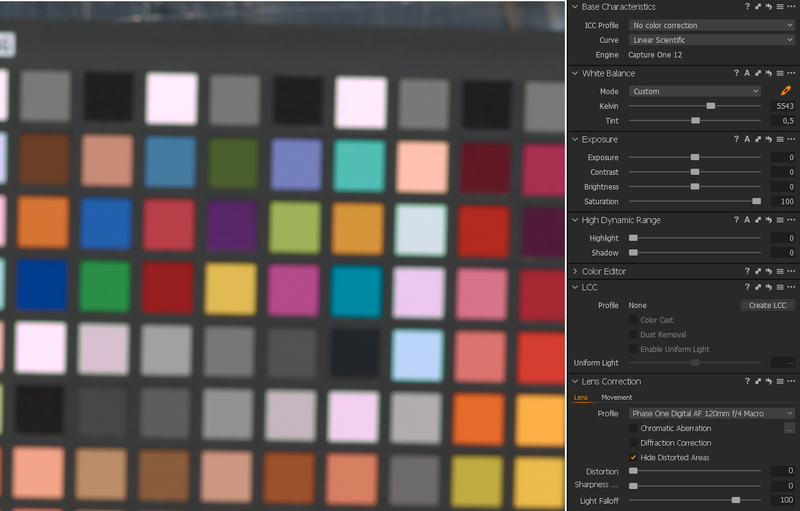 Of course white balance will always show slight alterations - especially with a colorchecker target with many different points. Which ones do you use for your white balance exactly? Is that how the manufacturer intended it to be used? The ICC Profiles are there for a reason, as is the curve option. If you disable or set them incorrectly you won't get suitable results. If you use no ICC profile you don't allow the camera manufacturer to display the images as they intend them to show. If you use a curve that does not fit the image you will not get a good result. Linear or Linear Scientific are not intended for regulrar photography. As with regards to the second image it's the same thing. With correct white balance and Curve settings it will look fine. White balance for this image would be about 4.000k, right? So you're somewhere between daylight and tungsten. Try daylight and tungsten ICC profiles to see which one suits your need and looks the best. C-M-B wrote: Well I don't see any pink casts anywhere. C-M-B wrote: Of course white balance will always show slight alterations - especially with a colorchecker target with many different points. Those ones which I see as pink give green (and obviously wrong) WB. "Gray" ones give correct WB. C-M-B wrote: Which ones do you use for your white balance exactly? Is that how the manufacturer intended it to be used? I forgot it's code, but yes, it is recommended by manufacturer. C-M-B wrote: The ICC Profiles are there for a reason, as is the curve option. If you disable or set them incorrectly you won't get suitable results. If you use no ICC profile you don't allow the camera manufacturer to display the images as they intend them to show. If you use a curve that does not fit the image you will not get a good result. I must use these settings in order to create profile in 3rd party software. Also with proper back or 35 mm camera this "No color correction" and especially Linear response curve give absolutely predictable result. Not ideal or even good in case of "No color correction", but it is predictable - neutral patches are neutral in whole brightness range. To be precise - I often use "Linear response" curve in my work as I often prefer it's result over "Film ..." curve's. C-M-B wrote: Linear or Linear Scientific are not intended for regulrar photography. But I often use Linear (not linear scientific) in my work. Just because I like result. C-M-B wrote: As with regards to the second image it's the same thing. With correct white balance and Curve settings it will look fine. White balance for this image would be about 4.000k, right? So you're somewhere between daylight and tungsten. Try daylight and tungsten ICC profiles to see which one suits your need and looks the best. It can not look fine because there is strong pink cast in highlights, but as you do not see it, I suspect that we have something very different in our setups (what version of C1 do you use?). I use the latest version of capture one 12. It's the Pro Fuji version but of course still manages PhaseOne files (so I can still access my P65+ files). Again: I don't see any pink cast at all. There has to be a problem at your end, and I'm not talking about the back. What does your color management/calibration consist of? C-M-B wrote: Again: I don't see any pink cast at all. There has to be a problem at your end, and I'm not talking about the back. C-M-B wrote: What does your color management/calibration consist of? It does not matter at all - I see it both on my home pc (calibrated with i1 Display Pro + DisplayCal) and on work (not calibrated at all), and on my phone. Do you open your files in CaptureOne on your work computer or your phone? I noticed a few irregularities with DisplayCal and switched back to using the xRite software again. Could be worth a try. I can see the cast in the JPEG but I can't see it in the RAW. Only when I use wrong colour profiles and curves does it appear slightly pink(ish). C-M-B wrote: Do you open your files in CaptureOne on your work computer or your phone? On work and on home computer, not on phone, of course. The same behavior on both machines. C-M-B wrote: I noticed a few irregularities with DisplayCal and switched back to using the xRite software again. Could be worth a try. Sure, but the problem is present even on a PC without any calibration. C-M-B wrote: I can see the cast in the JPEG but I can't see it in the RAW. Only when I use wrong colour profiles and curves does it appear slightly pink(ish). This jpeg was developed from raw with No color correction profile and linear curve to exclude profile\curve impact. I also shot the same "scene" with sony a7r II to ensure that it is not a lighting problem. I also shot the same color checker in the same conditions as the first shot in this thread (direct sun) with 2 other DBs and only my P65+ showed such problem. So it is obviously not because of bad colorchecker, or monitor profiling. P.S. PhaseOne support finally agreed that it is a calibration problem and they are able to fix it with DB calibration.